Workers installing solar panels at Bishop’s Orchards in Guilford. No fewer than four pieces of legislation – half from Republicans, half from Democrats – have been filed to at least slow down, if not repeal, the process started through Public Act 18-50. That legislation was designed to implement an update to the state’s comprehensive energy strategy and was arguably the most consequential energy legislation since the formation of the Department of Energy and Environmental Protection (DEEP) in 2011. The enacted changes in the solar program are being cast as a counter to all of those. Solar adoption would slow and jobs would be lost, advocates say. And an unusual conglomeration of strange bedfellows that includes solar advocates and the utilities agree that – policy differences aside – the time frame set in the legislation to make all the changes really can’t be met. 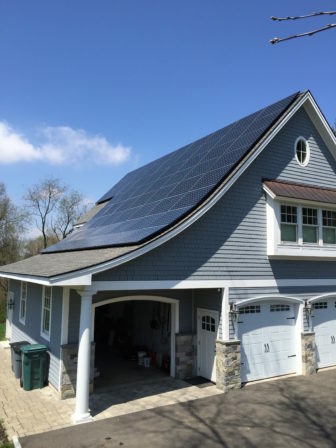 Net metering, while nettlesome to some, is a longstanding and widely used energy compensation system that Connecticut has employed for years. Solar customers are paid the retail electric rate for power they sell back to the grid during certain times of the day when they make more than they need. It’s subtracted from the power they buy from the grid when there’s no sunshine – at night or during bad weather. Nationally, net metering has been fought by utilities for years because they consider it a threat to their business model and bottom line. Most efforts to change it have been beaten back. The most notorious among them – Nevada. That state’s legislature ended net metering retroactively about four years ago, causing major solar companies to pull out of the state and Nevada to lose about one-third of its solar-based jobs before the legislation was reversed two years later. DEEP in the past has argued, along with the Office of Consumer Counsel, that net metering will push electric rates up and hurt non-solar customers – something often referred to as “cost shift.” Utilities have made that argument as well. In place of net-metering consumers would be given two choices, both of which are opposed by environmental advocates. One would be rates – known as tariffs – that would be paid to solar owners for their excess power. The rates, presumably lower than retail rates, and formulas for applying them would be determined by the Public Utilities Regulatory Authority (PURA) — a process that is already underway. But there is basically no way to have new metering approved, let alone implemented by then – even if the various parties weren’t fighting over the program parameters. Garcia is not opposed to a tariff, as long as it provides enough of a financial return to make solar systems affordable – especially after the 30 percent federal tax credit on solar projects disappears in 2022. But he said the simplicity of net metering has played a key role in getting people to invest in solar. An effort to institute an interim tariff – which would be allowed under the existing legislation – was rejected by PURA in January. Since then, PURA’s chair, Katie Dykes, has left to become DEEP commissioner, leaving only two commissioners and the net metering work incomplete. Garcia has offered alternatives – supported by both utilities – to PURA. One is to, in essence, continue RSIP after it hits 300 megawatts, but set the incentive level at zero as it only provides about 10 percent of a system’s cost now. But existing net metering would continue until a new plan is in place. The other alternative is to slow down the program by making incentives available only to low income applicants. 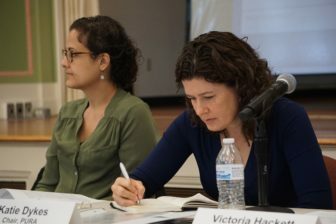 Incoming DEEP Commissioner Katies Dykes, formerly of PURA, right, and Mary Sotos, the deputy in charge of energy policy at DEEP. And that core – whether net metering should stay or go – still hangs over the question of how the state should proceed. All of which gets back to the issue of cost shifting and whether those without solar actually do subsidize those with it. A 2017 study by Lawrence Berkeley National Lab that looked at the potential for cost shifting from rooftop solar said if the penetration of such systems is low, any cost shift would be negligible. 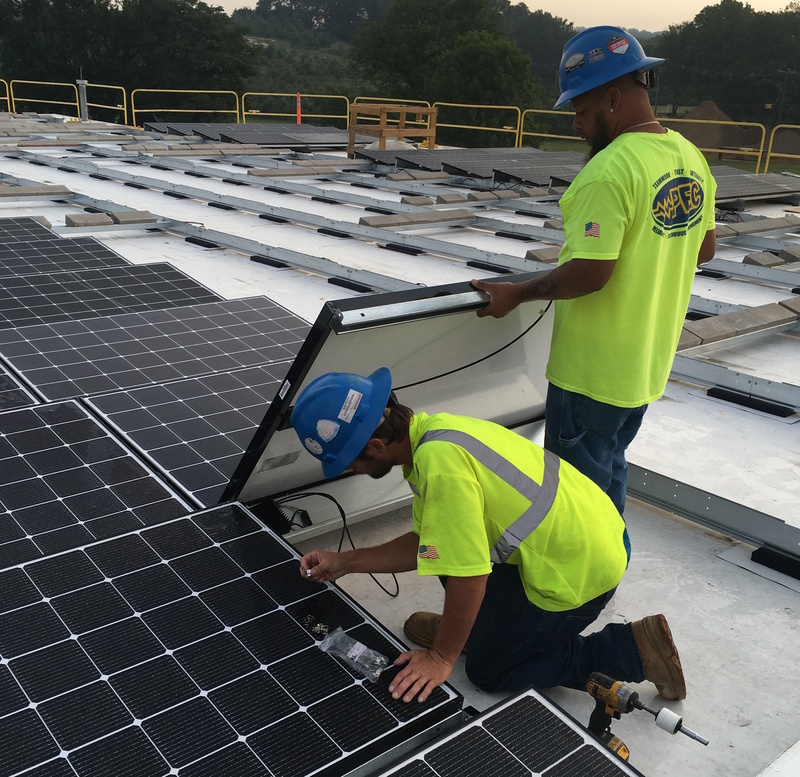 Penetration of solar in Connecticut is low – about 2 percent. They would also like to see caps on deployment of other solar programs – such as shared solar – removed. And to put to rest the notion of a cost shift that will raise electric rates, they have long argued that Connecticut needs to conduct what’s called a value of solar study, or at least collect the findings of many studies that have already been done. Those studies assess the benefits of rooftop solar for everyone on the grid: lower greenhouse gas emissions, combating climate change, less wear and tear on the grid’s infrastructure and more.